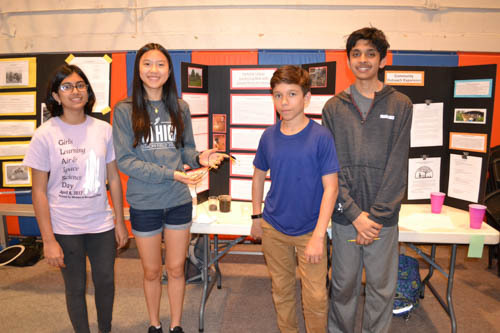 Uni High 8th graders demonstrate howtheir project, "Minimizing Microbial Contamination in Rainwater Collection and Storage" works. This past semester Sharlene Denos planted the seed of innovation in her University Laboratory High School (Uni High) 8th grade science students. In collaboration with local Champaign-Urbana community gardens, and funded by the Illinois Learning Sciences Design Initiative (ILSDI), her students unearthed problems encountered by managers of the gardens, then, based on science learned in school, as well as via research, got to work on how to effectively solve these problems. While the science aspect of their projects was important, the main focus was really on the design element. A team of students share about their project, "Portable Urban Gardening Bed with Circuit Moisture Sensor," with visitors. Denos’ goal was to have teams of students in her classes do science-related, user-oriented-design service projects for one of three community gardens: Randolph Street Community Garden run by Don Blackman; Prosperity Gardens run by Nicole Bridges; and Douglas Community Center Organic Garden run by Katie Hicks. So she wrote a proposal which was funded by ILSDI, an interdisciplinary, university-wide organization, whose funding is derived from the overhead from NSF grants. “It’s seed money that brings an interdisciplinary group together around interesting ideas and design education,” Denos explains, “with the idea that they would then take that initial work and turn it into something bigger, an externally funded grant. University High 8th graders present their poster presentations. So she decided to write a proposal, Making a Difference (which she calls “kind of cheesy,”) but she says was about “How do you take these extracurricular, after-school, maker-type experiences kids can have and bring them into—not a technology class—but a science class. So you make it a really authentic science experience…When the kids are trying to make design decisions, they have to design and perform a control experiment. Then they have to learn about heat transfer, or they have to learn about hydrostatic pressure.”She reports that they’re all learning about different things, depending on what their design concept is. Sharlene Denos, (front left) and several of the educators involved with her community gardens project. But while her students worked with the user to define their problem, she indicates they didn't work with the user to develop the solution because they didn’t have time. 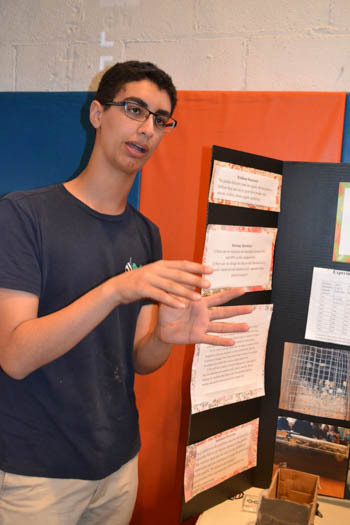 University High 8th grader explains his findings to Illinois researcher Barbara HUG. One of the key components to this process was that the students define “a really authentic problem.” So, to help the eighth graders come up with an idea, Uni High juniors acted as mentors, helping the younger students develop surveys for the users (the garden directors), to identify problems they might want to solve. After an initial meeting, the garden directors then came to the school and gave presentations to the students. Denos also took her students on a field trip to the gardens, so they could measure things, take pictures, and talk to the garden directors. 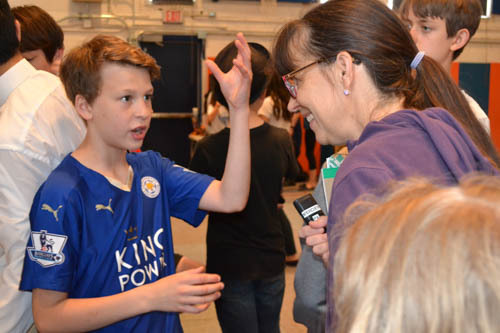 Student teams also communicated with the directors through email correspondence. After identifying an authentic problem, the students then brainstormed different solutions on how to solve the problem. And just like any other real-world problem, one constraint students had was a limited budget. In fact, Denos shares that in an interaction with one client, “When we asked what our budget was, she said basically, $0.’…All the garden directors told us…‘Oh, basically anything that you propose, I'm going to have to go and write a proposal!’… So we're just operating with the idea that we want to make it cheap!” admits Denos. So her students learned to justify decisions they made based on their data and the budget. A water wheel designed by one of the teams which would provide electrical energy to power something in the garden. What kind of projects did her kids come up with? For one project, titled, “Electrical Power Systems Through Rainwater Irrigation,” the team designed a water wheel to be placed beneath gutters (designed by another team). The idea was that as rain water flows onto the waterwheel, it would cause it to spin, and the resultant energy would be transferred to a battery which would provide energy for the garden. The latest design of how the team's passive refrigeration container works. How did her student know the most effective way to achieve passive refrigeration? “Well, this is a science class,” Denos explains. She goes on to explain that they learned about the three different categories of heat transfer: convection, conduction, and radiation. 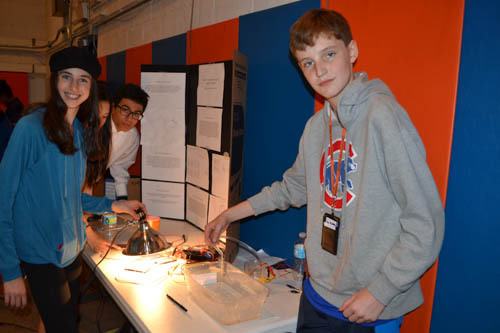 Students display an experiment about their findings from studying heat transfer. This group of students then went on to perform experiments where they simulated the air with hot water. Regarding the insulation, she says “And they try to see, depending on the thickness of the foam, how long it takes for the two temperatures to be the same.” Based on these data, they then calculated which materials and how much materials were significantly effective to their passive refrigeration. Another group of students who designed a greenhouse learned about optics. “So they have to think about, ‘What do you want a greenhouse to do?’” Denos asks. A student explains his poster presentation. She goes on to explain that you would want a material that allows visible light, or photons through. but won’t let the infrared light out. “That would be perfect for a greenhouse,” Denos continues, “because you're letting all the light in, and it’s absorbed, then it's reemitted as infrared, but the window won’t pass infrared and it reflects it back in so it keeps all the heat inside. And that's the greenhouse effect.” So her students were testing different materials to find which one would do that best. This entire process truly encapsulates the vision of Denos’ and Emma Mercier Making a Difference proposal, where students do user-oriented-design service projects to learn science. Plus, Denos is teaching her students to not make rash decisions solely based off their ideas, but to analyze the data and learn more about the topic they’re trying to solve in order to most efficiently and effective solve their problem. Also involved with the project was Susan Kelly, a Curriculum and Instruction doctoral student who helped with data collection. 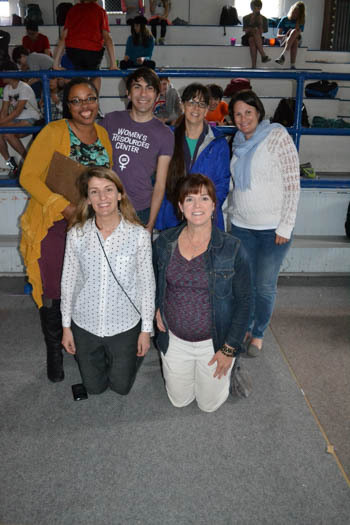 Kelly reports that she and the project PI, Emma Mercier, a Curriculum and Instruction Assistant Professor, were "interested in how a project based learning project played out in a classroom context." Susan Kelly and Sharlene Denos enjoy the poster session. Kelly, who helped with some aspects of the project coordination and with the field trip to the gardens, believes that the project helped build university-community partnership. "I think the project was a great connection to the local community and to the garden directors, and this relationship with continue to grow with future iterations of the project." "I think the project helped the students to see how engineering design principles could be applied in a local context to solve a community need. The students were exposed to ways that science and engineering play out in an authentic context, and they learned something about the process of 'doing science,' and that designing and experimenting is an iterative process. Thinking about the project through the eyes of the user, and designing with community needs in mind, was an important take away from the project." A team of students prepare to explain their project, "Developing a Low-Cost Rainwater Filtration Unit."